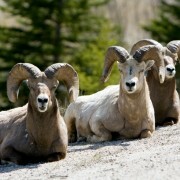 January 24, 2019 – Advocates for the West filed suit to halt the Rio Grande National Forest decision to graze domestic sheep within the habitat range of bighorn herds. The suit, filed on behalf of WildEarth Guardians and Western Watersheds Project, asserts that the forest managers knew the risk that domestic sheep would pose to bighorn, yet authorized grazing anyway. Domestic sheep carry a pathogen that, when transmitted to bighorn sheep, causes deadly pneumonia in bighorns and reduces lamb survival rates for years. The pathogen—known as Mycoplasma ovipneumoniae—is especially deadly because bighorns and domestic sheep are mutually attracted to each other. Once disease is in a bighorn herd, members of that herd can easily transmit the disease to nearby herds. There is no cure or vaccine. Our suit centers on the Wishbone allotment near Creede, Colorado. This new domestic sheep allotment was created after the Forest Service determined domestic sheep grazing in the adjacent Snow Mesa area placed bighorns at too high of risk. The lawsuit alleges that the new Wishbone allotment does nothing to reduce the risk to bighorns, and the Forest Service’s reasons for reducing the risk rating of the allotment and allowing grazing there were arbitrary. The agency failed to analyze recent telemetry data from Colorado Parks and Wildlife that clearly shows extensive movement of bighorn sheep near the new allotment. Senior Attorney Laurie Rule is representing our clients along with Maya Kane of Durango.